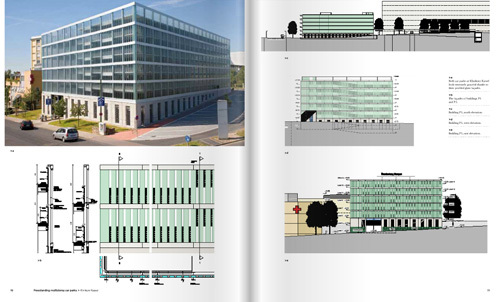 50 international multi-storey car parks with detailed planning material show new trends in the areas of multi-storey car park design and innovative parking systems. 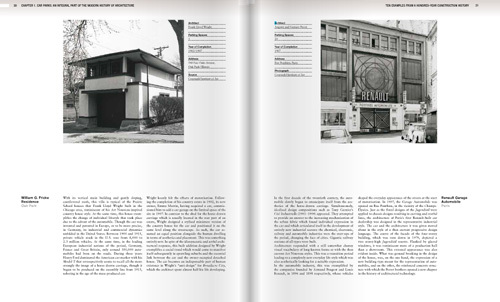 The book in our series Construction and Design Manual includes an introduction to architectural heritage with many sample buildings, illustrated with large-format photographs. The appendix contains standards and measurements in chart form, presented in an easy to understand way – a practical tool for designers. Nobody likes multi-storey or underground car parks. Their many dark corners seem to reflect the darker side of society – any thriller will tell you that these ill-lit, inaccessible, and cramped spaces are hotbeds of criminal and accidental violence. Not dramatic potential but user friendliness is what interests Ilja Irmscher, however, who has tested car parks for the German automobile club ADAC since 2010. Only too often does he have to censure narrow ramps, poor lighting, confusing signage, cramped parking spaces, and serious accessibility problems. Under the rubric “Car Parks from Hell” the media in the past few years have given these worst practice examples extensive and spectacular coverage. Building good car parks may be difficult, but it is possible, and there are model facilities to prove it. 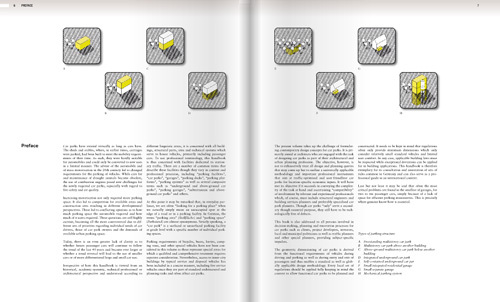 This is demonstrated in the two-volume compendium Parking Structures, now new in the series Construction and Design Manuals by DOM publishers. While Volume 1 gives a detailed introduction to planning fundamentals, Volume 2 presents forty-five international, user-friendly examples of good design. 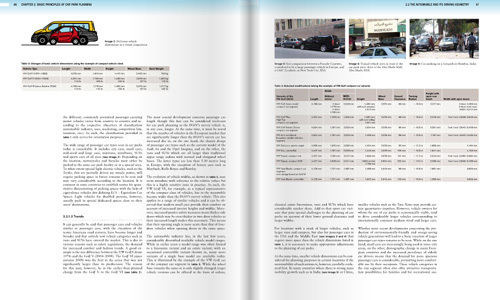 On more than five hundred pages Irmscher, the scourge of car park operators, and his proven team of experts showcase solutions that are practicable, economical, and functional. 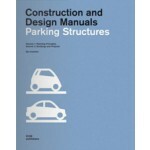 Put together with academic thoroughness and an unashamed claim to completeness, this compendium addresses all types of car parks and technical systems, including independent and integrated as well as underground and surface facilities, mechanized and automated systems, and the latest trends in planning and realization of innovative structures. Well written texts explain typical situations, with graphs and images to illustrate norms and dimensions. A change of perspective is clearly emerging: despite the building type’s general lack of popularity, there is a trend towards more confidence, with car parks being erected in city centres and sometimes even as part of corporate architecture. Underground car parks are quite literally a mainstay of modern architecture, since they often form the core of structural foundations. This makes it all the more important to integrate parking systems into the planning process at an early stage. 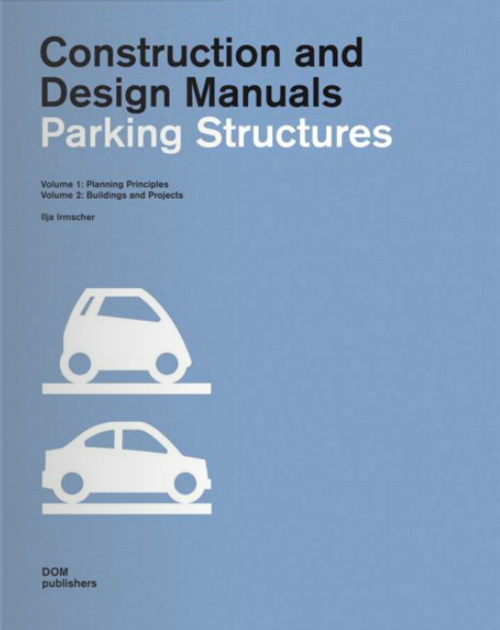 This work of reference closes a gap in the market; its precision and universal approach make it recommended reading for architects and their clients as well as car park operators. Ilja Irmscher (born 1956), Dr.-Ing.habil., taught automotive engineering from 1988–1992 and in 1993 established an engineering service for parking and traffic development, GIVT Gesellschaft für Innovative VerkehrsTechnologien mbH. Since 2001 he has been a Chamber of Industry and Commerce expert for stationary traffic, parking, and parking facilities. This led to his discovery of the poetry inherent in parking facilities that he now seeks to convey to readers.